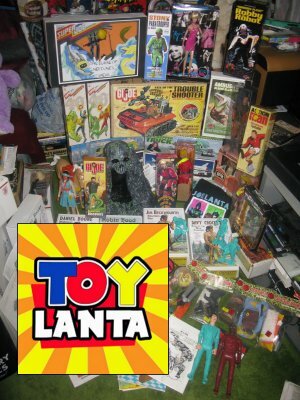 Less than one week after it wrapped, PopCult presents our video highlight package for ToyLanta, the new name for JoeLanta and The Great Atlanta Toy Convention. With the addition of BotLanta this year, a shorter name was needed, and ToyLanta is it. This brisk half-hour looks at the many facets of ToyLanta: The custom figures; the dioramas; the toy dealers; the music; the panels, the film festival, the parachute drop and more! We are thrilled to have this video onine now, instead of taking eight months to produce it like we did last year. Over the next week PopCult will bring you loads more video of the panels, dioramas, dealers rooms, and other cool sights and sounds from ToyLanta. In this video you will see amazing toys, toy soldiers parachuting fifteen floors indoors, a musical blue gorilla, panelists from around the world and even Larry Hama, the creator of GI Joe: A Real American Hero, singing and playing guitar. We also bring you soundbites from some of the organizers, dealers, and attendees. ToyLanta happens every March in Atlanta, Georgia. It’s not too early to find out about next year’s show. Visit ToyLanta.com for early details on how you can be part of the coolest toy show in the South. For timely updates, check out their Facebook page. In a special “I can’t get any clip online this quick without some screw-up” note: I apologize for misspelling Bryan Tatum’s name onscreen in the video. Of course, that’s the precise frame that YouTube would pick for the thumbnail. Sorry Bryan…and thanks for the cave!